Taeyeon. They might not be the most bambi, but they come through and match her face pretty well. 'Gee' MV back in 2009. Out of nine(9) girls, this particular girl with a pair of unique eyelids...caught my eye. All because of her unique eyelids. Both her eyelids...the angle it made from her nose. To be honest, I did the measurement just now. Prior was just a wild guess. I am sure there's a correct science explanation about eyelid position. Best to measure Taeng's eyelids when she's not putting on any make up. You made me Googled...so...the scientific name is epicanthal folds; angles between lower eyelids. Tiffany, without a doubt. Even when she's not smiling..
Definately eye-smile queen Tiffany !!! 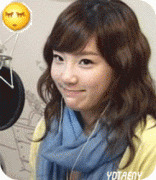 has to be taeyeon, her cross eye is so cute!